One of the nice things about coming back to the ukulele after a long layoff is that I now find myself thinking about it, the ukulele, that is. And when you think, sometimes you see things--things that may be obvious to others but never registered for you. For example, how many times have I looked at a long string of chords in a piece of ukulele sheet music with my first thought of being how to simplify it. Yet, simplifying often removes the part that makes the ukulele shine...without making things simpler! If we take a closer look at the sequence, we see The only thing the intimidating sequence [Gmaj7] [G6] [Bbdim] [Am7] is doing is letting our fingers go for a walk! The [Gmaj7] has us moving from the 3rd fret of the second string to the 2nd fret. The [G6] removes a finger from the second string, effectively moving from the 2nd fret to the 0th fret (the nut). 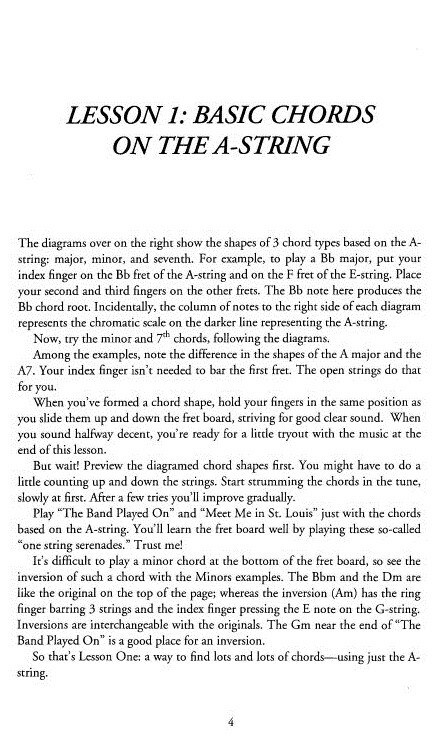 The [Bbdim] moves the fingers on the first and third strings one fret closer to the nut. The [Am7] has us remove our fingers from the first and third strings. It's a lovely finger dance that says, "You're listening to a ukulele." The CAGED system is a device used by guitarists to help memorize the fingerboard. Rather than discuss the CAGED system, let's go right to the ukulele equivalent, CAGFD. Those 5 chords are The black circles at the top above the nut, indicating an open string, are important. If you can, imagine your index finger making a bar across the nut and using your other fingers to cover the strings as indicated in the diagrams. Before explaining the CAGFD system in words, let me show it to you in pictures. While the shapes are different, they are placed on the fingerboard so that every chord is, in fact, a C! The C and A shapes overlap at the 3-rd fret, that is, the fret for the finger farthest up the neck for the C shape is the same as the fret for the finger closest to the nut for the A shape. The A and G shapes overlap at the 5-th fret. The fret for the finger farthest up the neck for the A shape is the same as the fret for the finger closest to the nut for the G shape. It's a bit different for the G and F shapes. The G and F shapes are the same except for the note on the 4-th string. It's also a bit different for F and D shapes. They don't overlap, but they abut. Many ukes do not have 15 frets but, for completeness, the D and C shapes share a bar at the 12-th fret and differ only in the note on the 1-st string. And that's the CAGFD system for Ukulele. Find any chord in five positions on the neck. It's called the CAGED system for the guitar because similar shapes on the guitar and ukulele have different names. The CAGFD System: Another Way To Look At It! I've known about the CAGED system for guitar, but had never been able to master it. I'm finding that I'm often able to see things better on the ukulele with its 4 strings. While thinking about the CAGFD system, I was struck by a breakthrough insight: Turn the system inside-out! 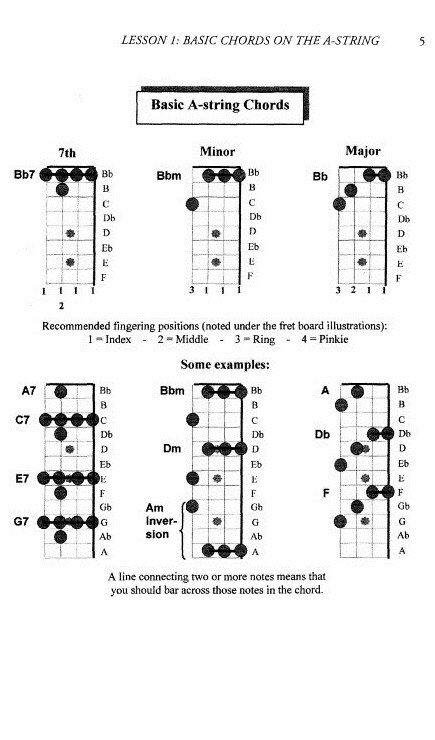 Rather than learn frets at which each chord's shapes are located, learn what chord is produced by each shape at each fret. The chord produced by the C shape is named by the note on the first string (A). The chord produced by the A shape is named by the note on the first string (A). The chord produced by the G shape is named by the note on the second string (E). The chord produced by the F shape is named by the note on the second string (E). The chord produced by the D shape is named by the note on the third string (C). After I finished the first version of this page, I learned of Ukulele Breakthrough by Calvin Chin. I was on the right trail, but I wasn't sure where it would lead. Chin showed me and got me there on the express track! Chin's Lesson 1 tells the story. Pick a song you know (preferably in A for this exercise by not required). Play it by using only chords of the first positition A, Am, and A7 shape. Moving them up and down the neck as needed. The three pages of Lesson 1 are viewable through Amazon's Look Inside feature, so I've included them here. There's not much more to be said. Try it! As I type this, I see two major implications of approaching the fretboard this way. In my experience, many of the notes of a melody lie under the fingers making the appropriate chord. Knowing the postions of the chords on the fretboard should make chord-melodies much easier to construct and even grab on the spot. I'm curious to see whether this proves to be the case. 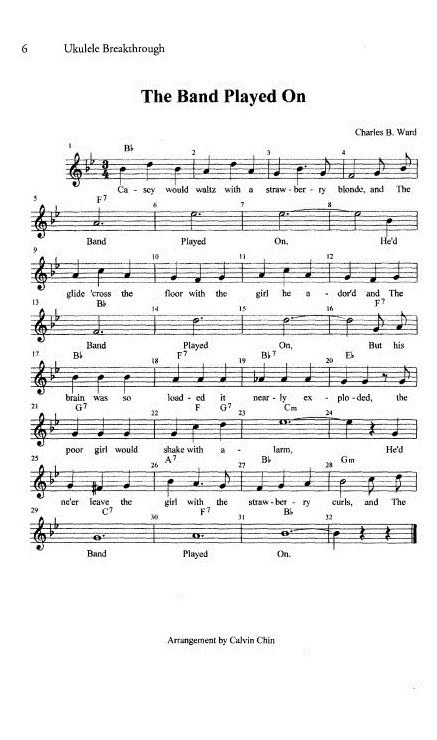 Chords with long strings of letters and numbers on the end. 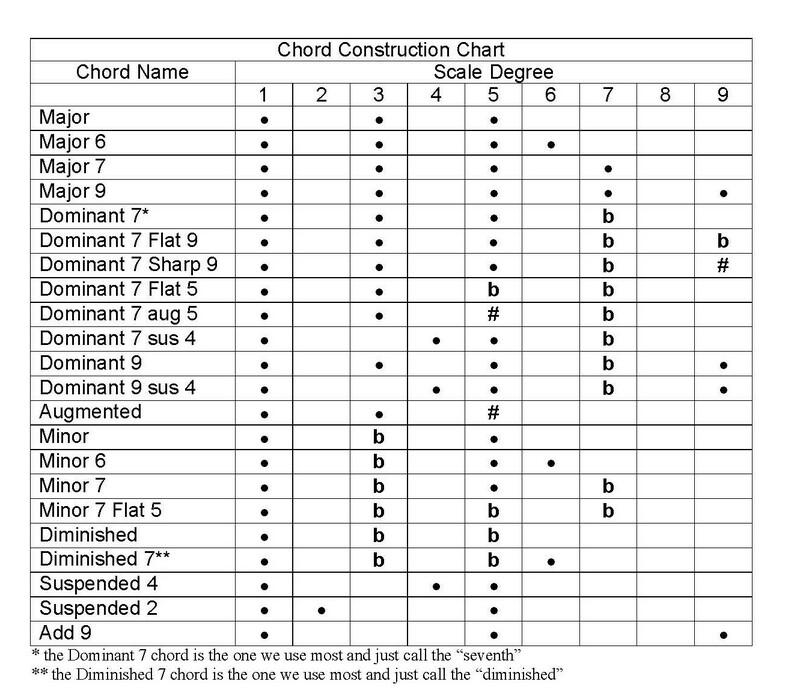 Here is an outstanding chord construction table from Cheater Theory (v2) by Howlin' Hobbit. The entire document is worth a read. Here are two of the many ways to use it. (remember whole, whole, half, whole, whole, whole, half). Then (1,3b,5,7b) becomes (A,C,E,G)...the open strings! Modifying a chord. We know that the A shaped C chord is (5543) or (C,E,G,C). Suppose we needed a Cmaj7, that is, a Cmaj7. The chart tells us to add the 7-th note in the scale, B. We've got two Cs-that's one to spare--while the 2nd fret of first string is...a B! So, Cmaj7 is (5432)=(C,E,G,B). The usual first postition Cmaj7 one finds in chord charts is (0002)=(G,C,E,B).